This page is for Fall 2018. We will update before Fall 2019. For the fall, we offer an in-house program that has 2 unique & independent options. Our vision is to safely continue player growth in skills, knowledge, and confidence via a focused supplemental program during the traditional off-season. Focus: Instructional training on hitting, position specific, and in-game situational training. We will eliminate keeping score and stats with no-umpire, non-competitive, learning-focused scrimmages in order to provide specific situational training. Instruction: Experienced coaches with over 100+ years of coaching will lead the academy sessions. This is a great time for those interested in coaching and are looking to learn before taking the head coach role. Programs for under 8 will resume in the spring. Each registered player will receive 2 shirts and 1 hat with their registration costs. In lieu of shirts, you can opt for a batting helmet during registration. Batting helmet fitting will be done the first week it will take a few weeks to get them so they'll be able to use them at the end of fall and then in the spring. This extra option was to give parents the choice of shirts or a helmet. Players can wear any baseball pants/jeans they have. If you want baseball pants, they can be ordered by contacting the Uniform Coordinator on our About Us page. Schedule: Beginning September 4th and ending Saturday 10/27. Dual locations: EBA Facility 300 W. Chestnut Street and Snyder Park fields. Each week schedule will be communicated. We understand there are other sports and obligations that occur in the fall. There is no attendance requirement for this program. After registration and you receive your coach's information, please let he/she know your player’s availability each week so they can prepare the scrimmage plan accordingly. The first practice will be September 4th. This will be exercise and conditioning for players who are looking to take the next step. Schedule: Mondays & Weds 5:30-7 pm; First session is Weds September 6th. What to bring: No baseball equipment is needed for this program. Please bring water and a towel. All players should wear comfortable, exercise clothing & sneakers. Attendance Requirement: Attend when you can but don't let someone outwork you! :) Please communicate your player’s availability to the leader. Why are we not playing in the LCYBL in the fall? The EBA has a long history of providing superior instruction and game opportunities to players from K-12th grades. The fall program, associated with LCYBL, was a good option to provide players and coaches to for additional game time experience & to build confidence. As we progress for the future, the EBA reviewed what we wanted to accomplish and what we needed to do to achieve our goals. We made the decision to transition to an in-house program which provides all of us more flexibility to capitalize on our K-12 cohesive program and the indoor facility for the benefit of more parent-coach & players. We will be part of the LCYBL and Little League in the spring. Do I have to sign up for both programs? A: No. Each program is run separately. Does my player have to attend all sessions? A: We obviously encourage attendance as much as possible but that is the one of biggest benefits to the program. They can attend when they can. We just ask that the parents keep the instructors/coaches aware of the plans. Can girls register? A: For sure! The age requirements apply to all registrants. Is there financial assistance? 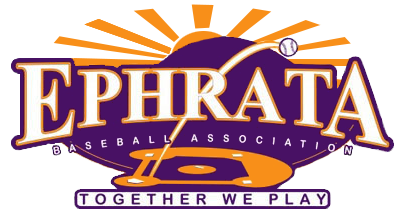 A: Please submit your request to info@ephratabaseball.org and we'll review each request. Important: As with all new programs, there will be some bumps in the road (disorganization, misunderstandings, etc) but we thank you in advance for some patience and support for the big picture. A similar program was done last winter with the High School team and the EBA believes in High School Coach Adrian Shelley’s vision that we play too many games and focus too much on “keeping score” in these early years. With this new fall program, one big change for most of us (players, parents, and coaches) will not being able to say “we won” or “keep stats”. Our measurement for success will be about how much they learn, improve, and love the game. We ask for your support in discussions with your player to support the vision and focus on learning the game without keeping score. We also invite parents to get their clearances so they can be on the field, with the coaches to ask questions, and learn as their players are learning.